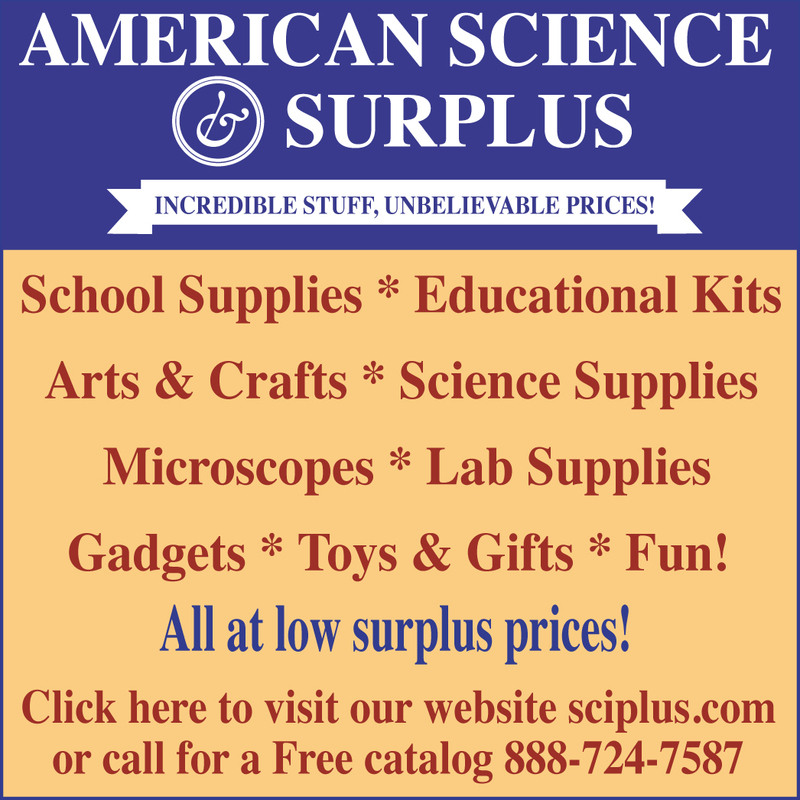 American Science & Surplus is a very unique company that offers thousands of interesting regular — and some ever-changing — items, for very economical prices. They get in new shipments all of the time, as befits any good surplus store, and their website and catalog have to be reviewed often for new bargains. They have a great sense of humor, too, so reading their descriptions is entertaining in itself. AS&S provides items in a quantity of one or in some cases, three, but unlike many other science supply companies, one does not have to purchase a large quantity of something. AS&S offers Adult and Kid toys such as a bike-pump rocket launcher that will put a rocket up to 1,000 feet into the air! Then there is the Rube Goldberg-type marble track that fits on the front of your refrigerator — talk about a conversation piece! Or, another fridge-front “toy”, a set of seven battery-operated gears that are fridge magnets! They also sell the Levitating Globe you may have seen on someone’s desk or in an upscale novelty store. The world replica hangs suspended in mid-air by electromagnetism. Another unique conversation piece is a Mirage Maker. You drop a small object (a penny or flower) into the device and it creates a replica of the object floating directly above. AS&S has many more devices and “toys” in the same section of the catalog. These are perfect for a boss or colleague who appreciates such sophisticated novelty items. In the more serious vein, AS&S offers a wide variety of gauges and testers for scientific or household use. Voltage testers, outlet testers, a decibel gauge, a wind-speed and temp gauge — even a Christmas light tester for less than $2 plus S&H! There is a very nice looking and professional portable oscilloscope or also available is the full-on Elenco table-top model oscilloscope. For homeschooling science teaching, there are four beginning electronics kits, with projects and suggestions for ages 10 and up. There is also the classic Build Your Own Crystal Radio Set kit here, just like in the 1950s and ’60s! There is the Smithsonian chemistry set, Make Your Own Slime kits, Crystal-growing kits and lots more in that department. AS&S offers a wide variety of “visible” anatomical products, such as the horse, a visible person, with multi-colored internal organs, the layered plastic head of Julius Caesar which can be reduced from normal to muscles and bones. There are two visible people, and skulls and full-length skeletons, some very affordable, some more expensive. As you would expect from a science supply company, there is a large assortment of lab equipment and supplies, including beakers, test tubes, pipettes, petri dishes, alcohol burners, which are safer than Bunsen burners, but hot enough for most science projects; scales of all sizes, lab clothing, and a T-shirt with the Period Table of Elements emblazoned across the front of it! American Science also offers some great tools, such as a mini-grinder and a small, portable battery-operated engraver tool and grinding wheels and sanders for Dremel power tools.